Dance is defined as the rhythmic physical movement promoted by feelings and emotions. The rhythmic movement may of any or all parts of the body in accordance to some scheme. Every beast and human being dances to express the innermost passions. But dance as an art came into existence with the growth of human society and civilization. We find a detailed account of this art in several old Sanskrit works - Abhinaya Darpana, Bharata's Natyasastra, Sangita Ratnakara, Dhananjaya's Dasarupa etc. All these books give more or less the same account of the origin of Sangita. We find three essential features in a dance - (1) A spontaneous movement of the muscles and limbs under the influence of some strong emotion, feeling or passion, such as joy, pleasure, anger or religious exaltation; (2) pleasure derived both by the dancer and the spectator due to a definite combination of such graceful movements. (3) the vivid representation of emotions in other people except the dancer due such careful trained movements. The dance in India can be classified into three groups: The Tribal, the Folk and the Classical. The Tribal dance is the rhythmic formulation or expression of the joys and benefits of a people once referred to as 'aborigines', but are now called Adivasis meaning 'original inhabitants'. Almost akin to these dances but less ritualistic in content are the folk dances, which are as varied and as reflective of the day-to-day activities of the mass of the people as their primitive crystallized and transmuted into stylized interpretations of divine activities are the classical dance forms which are practiced exclusively by the votary. 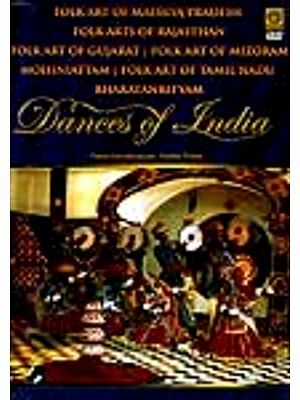 This book describes art of dancing with particular emphasis on classical and folk dances of India.